Australian Mist Cat breed information and advice. Australian Mist cat breed information and advice. The Australian Mist makes a truly stunning family pet. These beautifully ticked kitties are amongst the most moderate breeds - with nothing extreme about their appearance, personality or care requirements, you'll find that they comfortably slip in to your furry family, no matter what sort of lifestyle you have. "Mists were developed to be indoor cats," explains Tricia Bristow, chairman of the Australian Mist Cat Society. "They make wonderful pets and are suitable for families with young children, people living on their own, and the elderly and disabled." According to Tricia, once you let an Australian Mist into your heart and your home, you'll be lent a 'helping' paw in every task - whether you need some assistance or not! "They want to be involved in everything you do, from sorting the washing to making the bed, from helping to unpack the shopping to sampling what you are cooking. They particularly like helping with anything to do with food and they can be quite greedy if you let them," she adds. Their foodie tendencies are only reinforced by their cunning intelligence. Owners should be wary of leaving food unattended, and these Aussie wonders can soon calculate their way past the intricacies of a closed fridge door. You may even need to consider using child locks on your cupboards to stop these wannabe gluttons tipping the scales! You needn't worry too much about the Mists' antics though - Tricia assures that they're well behaved and their intelligence is rarely put to cheeky use. "They're playful and often persuade their owners to play fetch with a screwed-up ball of paper or a toy," she says. "And if you want a lap cat, then a Mist is for you! The Australian Mist is an even-tempered cat that is very tolerant of being handled and is not inclined to scratch. Even as tiny kittens, they love to curl up with their servants! A Mist owner can expect a lifetime of purrs and cuddles from a loyal and loving kitty." Australian Mists were bred to be indoor-only cats and it's advised that new owners don't allow their latest additions to roam outside. Tricia says: "There are too many dangers outside, one of which is the likelihood of them being stolen as they are so friendly - this has happened! "Many owners cat-proof their gardens and supervise their cats outside, or build a pen where Mists can enjoy the sunshine and watch the birds. Mists can also be trained to walk on a harness; many enjoy being taken out this way." Read more about the Burmese cat breed and Abyssinian cat breed. As many Australian states do not permit cats to roam, Australian Mists were developed to be indoor cats by Dr Truda Straede in the mid-seventies. 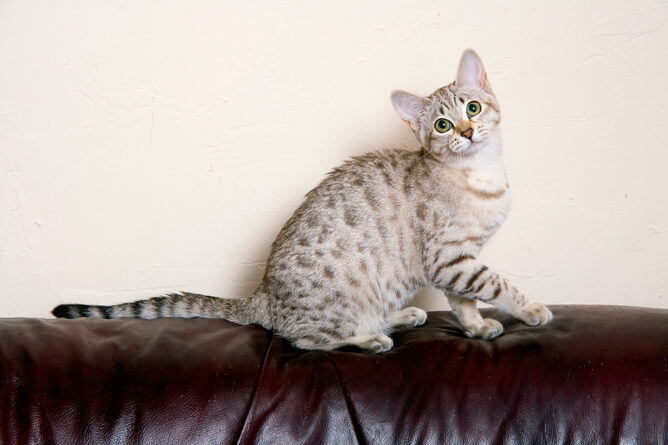 Over nine years, she bred the best parts of other breeds - half-Burmese, and a quarter each Abyssinian and Australian Domestic Tabby - and the Spotted Mist was officially recognised in Australia in 1986. Once the marbled pattern was introduced, the breed saw its name change. Two pregnant females were imported to the UK in 2007, followed two years later by six more males and pregnant females. In 2011, Mists were accepted for showing by GCCF and there are hopes that the breed will soon achieve Championship status, once the number of cats with merits has grown. This shorthaired breed's Burmese ancestors handed down their brown, blue, chocolate and lilac colouring, whereas gold and peach were Abyssinian contributions. A seventh colour, caramel, is currently going through the recognition process with GCCF. Australian Mists have either spotted or marbled coats, although both patterns have spotted tummies. Their coat patterns have three aspects: the ground colour, the pattern, and the 'misting'. The 'misty' appearance is caused by ticking, inherited from the agouti coat pattern of the Abyssinian. All Mists have large, green eyes (any shade from chartreuse to aquamarine), which are set wide apart to offer a gentle expression, balanced well with their moderately large, round-tipped ears. They have medium to large bodies with gently rounded, broad chests. These muscular cats often feel heavier than they appear. "We have not had any health issues that are specific to the Mists," says Tricia, adding: "Although one Mist was DNA-tested in the early days of GCCF recognition and found to be a Pyruvate kinase deficiency (PKDef) carrier. Breeders now test routinely for PKDef in our breeding cats. No others have proved positive but it would be easily bred out by ensuring that no two carriers are mated." In terms of grooming requirements, the Mists' short coats don't need much maintenance. A quick brush once a week is usually enough, and, of course, cuddles and strokes will help to keep a coat in good condition! With only a few breeders in the UK, potential owners may have to join a waiting list for a Mist kitten, especially if you want a specific colour or pattern. Speak to as many breeders as possible before deciding where to get your kitten from, and make sure that you meet mum (and dad, if possible) whenever you see a litter. Kittens should be lively, happy and healthy - they'll likely be far too busy to sit for a cuddle but you should be able to see their personalities whilst they play. They should have clear eyes with no discharge, with clean ears and bottoms. Their tummies should look full but not bloated. Don't forget that Mists won't develop their full eye colour, coat colour and texture until they're two years old. If you're looking for an adaptable lap cat who can provide love and laughs without too much chaos, look no further than the Australian Mist. As they're so people-friendly, Mists don't cope too well on their own and may become stressed or destructive if it happens too often. However, if there's another cat or dog for company, they should be fine. As Mists have been bred to be indoor-only cats, you won't need a garden - although if you do have an outdoor area, you can always find a way for your Mists to enjoy some cat-proofed time outside.The breed is also fine to live with other pets and animal-savvy children, and many have been happily homed as adults with elderly and disabled people. Hazel Brett describes her hilarious and heart-warming life with Valin and Vigo - also known as Piglet and Nutter! "I first heard about Australian Mists when I was looking for Burmese kittens. I'd had Burmese cats before and, having recently lost a dear old stray cat who walked in on me and stayed (for 18 years! ), I thought it might be time to get a couple of Burmese again - preferably before I was sought out by another homeless cat who wouldn't tolerate another one in the house! "I happened across Australian Mists on the Internet and was immediately intrigued - as well as won over by the adorable kitten pics, I'll admit. I contacted Tricia Bristow - having in the interim (of course) inherited another stray, Pud, who was (of course) showing every sign of not being terribly open to the idea of any feline housemates. "Valin and Vigo are full brothers, now aged one year. Valin (aka Piglet) loves his grub and anything edible has to be firmly locked away. He'll nick biscuits, cake, cheese, sandwiches, chips - well, pretty much anything! He can open the fridge too. Valin is the very cuddly one who loves laps, beds and 'helping' around the house. How anyone changes duvet covers without him, I just don't know! He is a strong character - the perfect Mist temperament - always happy, and never stops purring. He sometimes wishes his brother was anyone but Vigo, so he could get some sleep, but they adore each other really. He even likes the vet! His ambition: to learn how to use the tin opener. "Vigo (aka Nutter) is sometimes described as the Duracell Bunny. He's always busy playing, chasing, climbing, or getting muddy. Like his brother, he's also a huge help around the house - he loves interior design, preferring everything on the floor. He has a very different personality to Valin but he's also utterly adorable. He loves laps - when he has time - and playing with his many toys. Vigo eats when he can fit it into his busy schedule and he sleeps only when completely exhausted. His ambition: to defeat the cat-proof fencing around the garden (ProtectaPet fencing - excellent investment, has been severely stress-tested!). "They are great company - very funny, intelligent and communicative. Valin will gently tap you to indicate what he wants; Vigo prefers a more direct approach. He wakes early and drops his favourite toy on my face at around 5am most mornings to see if I fancy playing yet. "Both sleep in the bed and would mostly sleep through a nuclear attack! They have perfected the very-sad-cat approach if it looks like you're going out. "When they first arrived, they won Pud over straight away. This seemed to involve convincing her she was their mum. In no time at all, they were sleeping in her basket and she was washing them. They also completely accepted a rather lonely/ misunderstood Bengal boy who joined the gang a short while after they arrived. He had become a delinquent in his former home, but no longer has time to think about doing bad things - Vigo keeps him busy! "I work at home which means they don't get left alone very much at all. Valin sleeps wrapped around my neck sometimes when I'm working. Once on a teleconference, everybody dialled off and back on as there was such a funny noise on the line. I couldn't hear it and then realised Valin was dozing with his nose on the microphone - purring loudly! Vigo brings me earthworms whilst I'm working, in case I need extra sustenance. He likes to jump up on my lap and drop them right on my keyboard. You have to congratulate him or he gets quite upset! "Australian Mists are the perfect cats! They need company and devotion but they give a huge amount back in return. They have the most amazing temperaments - they are real people in their own right." A full feature about the Australian Mist cat breed was published in the February 2016 issue of Your Cat Magazine.